Fully 2/3 of the global workforce report being apathetic or disengaged: The very opposite of empowerment at work. 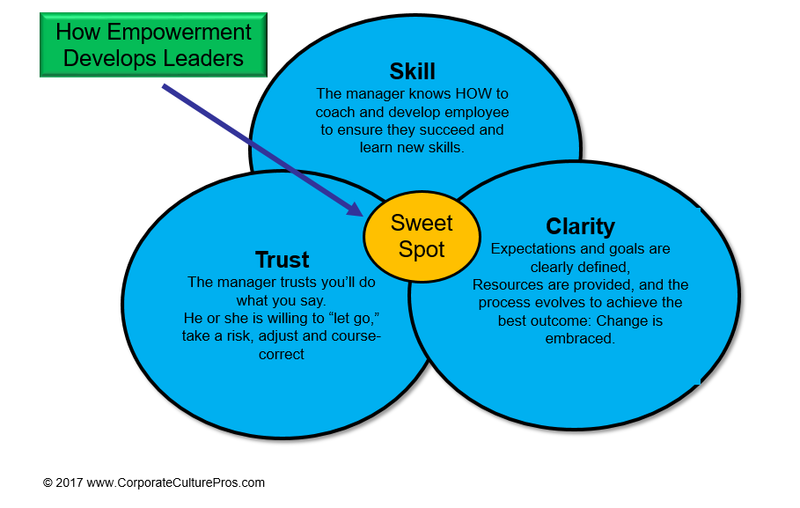 Empowerment at work is misunderstood by most leaders. It is not a simplistic delegation of authority. Empowerment at work is ensuring people have the resources, knowledge, and skills to succeed in a fast-paced modern work environment. Empowerment cultures are central to the modern workplace, and key to ensuring you attract and fully utilize a new generation of employees. I have interviewed hundreds of Boomer, Gen X and Millennial people about work, corporate culture, what conditions help them perform best. The ability to make a difference and enjoy being at work. Yet, most companies still mirror a parent-child relationship in how work is conceived, organized, delegated, structured: Top-down decision making. Over-monitoring and controlling employees. Internal competition and turf wars. This kind of culture pits empowering people against business goals of maximizing productivity and profit. How do you empower people before they are ready? For Millennials, work is no longer a one-way contract, in which one side has an imbalance of power. In the under-30 crowd, not one person I know wants to work in this type of culture (even though some openly admit they will do it for the experience, and leave as soon as possible). Their motives are different, so we must accept their leadership will look different. Like any generation before, the incumbents may not agree with what is happening, yet still accept responsibility to pass the torch. The speed of change demands it. Companies who resist, will increasingly struggle to find and keep employees and customers. Encourage friendly competition to see who steps up. 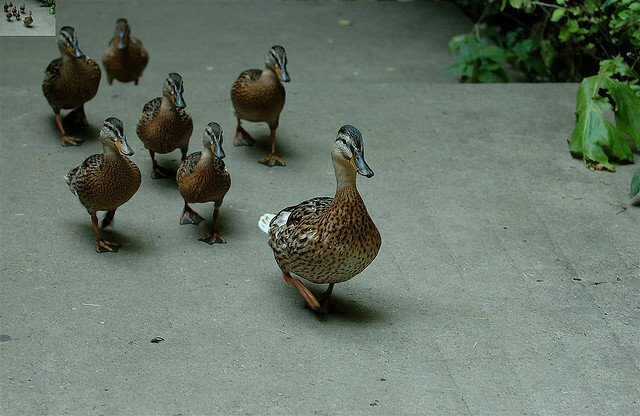 Take risks on employees who show enthusiasm and positive influence. 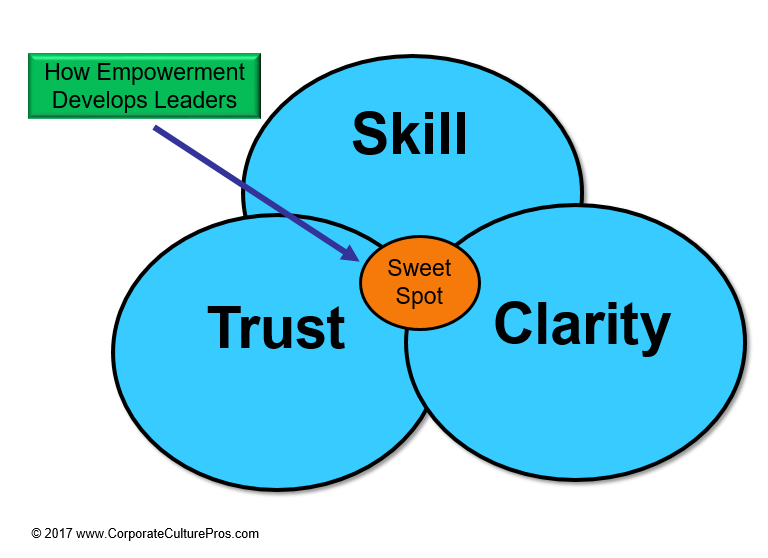 De-emphasize hierarchy; make teams the central element of high performance. Less classroom learning, more learning by doing. The vast majority of companies ruled by Boomers and X’ers are scratching their heads in how achieve this. Old World mindsets of authority, hierarchy, and power have been in place for hundreds of years. They still dominate our systems and structures of work. Companies with a lot of history have a distinct disadvantage over startups who were invented for this generation. Old World mindsets assume authority equals wisdom. Leaders have the best answers. Tow the line, pay your dues, be patient, maybe one day you’ll get promoted. Remember Barnes and Noble? Camelot Music? When house-hunting required a realtor? Passenger train companies in 1940 didn’t believe airplanes would eclipse their business … until they did. Every company that wants to be relevant in 5 years must learn to view the world through the eyes of future employees and buyers. “This will never happen to us” is the most dangerous thought any CEO or leader can have. What if the people you need to hire, don’t want to hang around you? Millennials won’t work in the Old World. (If they do, it is to learn enough to find a better job or go out on their own.) Once they gain power, they will change the rules. Building a New World culture starting today, is an exciting and sometimes daunting proposition. The evolution of work in every way – what we do, with whom and where, when – requires understanding how people’s motives and identities have shifted. In developed societies, we have transformed our entire life experience in two generations. Foraging for food and other security-based motives no longer motivate people in developed countries, the way they used to. The Modern Workplace IS about fostering intelligent empowerment at work, to create intelligent change. 1) Realize innovation is the business you are in. (regardless of your industry). Coasting is going downhill. The greatest innovation of organizations today, is to innovate HOW work and life are done, so that empowerment at work is a natural thing, and a skill people learn as preparation for being a good leader. Take Meetings. They are often viewed as a meandering, aimless waste of time that ends with no decisions or clear actions. What if we ditch traditional meetings? Implement walking meetings. Standup meetings. 15 minute meetings. I have observed countless meetings where amazing ideas emerge from “letting go” of a planned structure. I have also seen huge flops from assembling a group of smart, talented people who have no idea how to rescue a meeting gone awry. Ensure they have a clear purpose. End with clear actions and decisions. What would change if you promoted and trained leaders who really got this? 2) Many voices = greater influence. What would change in your organization if you adopted the Fingerprints Rule? “If you want people to own the goal, decision or project, create a process to ensure their fingerprints are on it.” Literally. The New World values inclusiveness, involvement, diversity. Diversity is visible: How many different kinds of views, people, ideas do you cultivate? Including many voices in creating and selling your product or service, expands how many want it. Inclusiveness is the first stage of ALL growth and innovation. As shown in the graphic, empowerment is not about eliminating boundaries or rules. It is about enabling people with the resources, goals, guidance, to succeed at an important mission – and coaching them along the way. 3) Master the creative process in your organization. It is the life source of Innovation. We are born creative. We are creative unless schools, adults, social norms train it out of us. Building systems, processes, and teamwork so creativity can flourish is essential to the Modern Workplace. Expanding your organization’s capacity to stay in front of ongoing, continuous change. Be curious. “I don’t know but let’s discover” is the new mantra. Be playful. Carve out times and places in the workday for comic relief. Watch a YouTube video. Toss a ball around the room while brainstorming ideas. Bring in masks and ask people to adopt a role on the team that is NOT typical. Google “Creative play at work” and implement these ideas! Be expansive. Widen the topic to include new and different genres – it expands thinking. Watch the Science Guy on YouTube. Read a book outside your field. Bring in a customer for a talk on a topic that has nothing to do with your project. Innovating how we do work ensures empowerment at work is the norm. It should be the most important focus of the corporate world today. When did anything great come without risks?